In a bowl, whisk together the coconut oil, coconut milk, lime zest, cumin, coriander, cayenne, salt and sugar. Add the soy sauce and stir to combine. Cut the chicken into thin strips or 1-inch bite sized pieces and marinate the chicken in the bowl for 2 hours. Heat up your grill or grill pan. 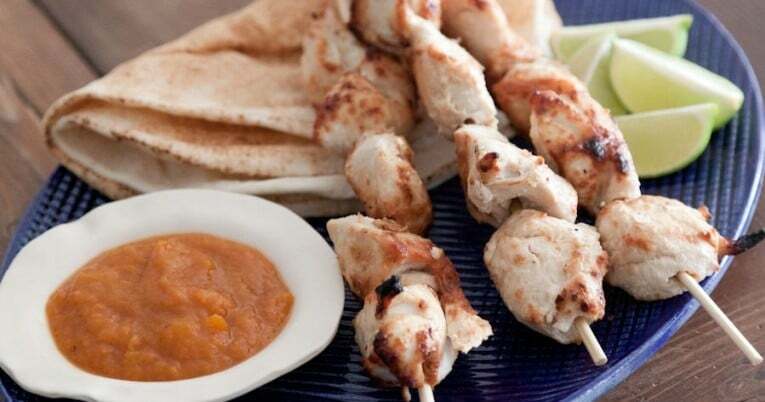 Take chicken pieces, shaking off all excess sauce, and thread them on a soaked wooden skewer or a metal skewer. Place the skewers on hot grill. Cook until nice grill marks have been achieved on both sides and chicken is cooked through, there should be no pink on the inside of the chicken. Set the chicken aside to rest. Combine the apricots, soy sauce, lemon juice and sesame oil in a blender and pulse for 30 seconds. Add the apricot mixture to a small sauce pan over medium high heat and heat for 1 minute. Add the grated ginger and stir to combine. Cook the sauce for 4 minutes over medium high heat until the apricot starts to break down. Remove from heat and set aside. Serve the skewers with the sauce on the side for dipping as needed.